Unusual 20MM single shot gun in 20MM Vulcan caliber. The receiver of this registered destructive device is a very well made single shot bolt action receiver. 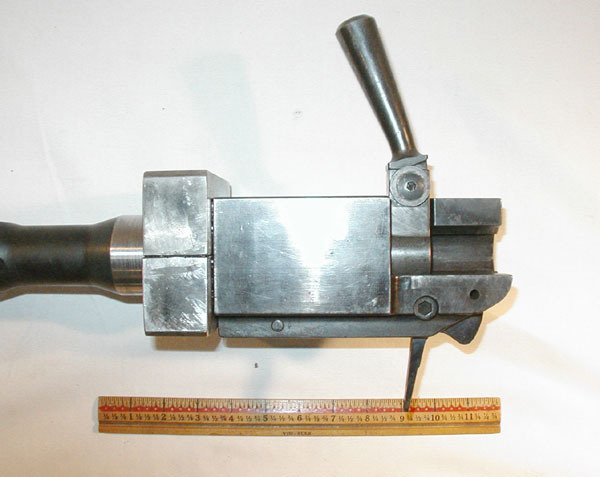 The bolt is designed to capture the cartridge before inserting into the receiver. See pictures. 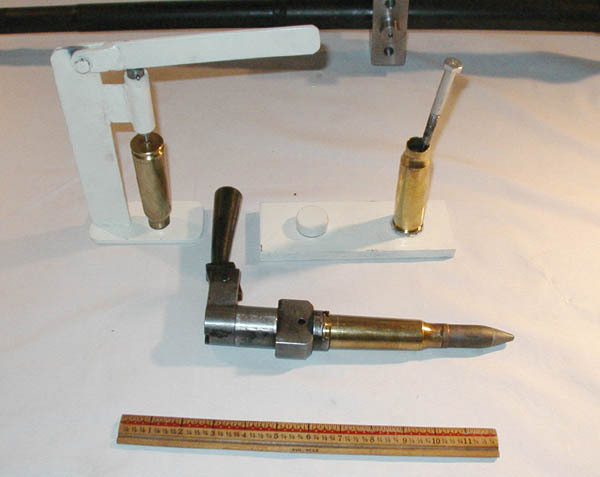 A cocking lever hammer on the receiver is then used to strike the firing pin on the bolt to discharge the cartridge. The recoil on this gun is considerable, necessitating the gun to be positively secured to a very heavy mount. Attachments on the gun were designed to attach to a heavy Russian or Chinese DSHK machinegun tripod in ground configuration, not anti-aircraft configuration. Other heavy mounts can be used if proper attachment devices are made. Or this could work as a subcaliber device for artillery if properly secured to the canon barrel. All 50 cal Browning machinegun mounts are totally inadequate for this gun. Also, do not even consider it for a 20MM rifle, no matter what you have seen or heard. Only sold to a purchaser able to demonstrate he has experience with ATF registered destructive devices. Included are rudimentary loading tools, brass, some projectiles and loading data. Percussion priming is used, not electric priming typical in Vulcans. This is achieved by installing a large rifle primer pocket to ignite 5 grains of black powder, used as a priming powder to ignite the 20MM propellant. Priced at $4,250 delivered. Can only be transferred to a destructive device licensee in your state. Also, this is not a C&R gun, so a C&R license will not afford approval as the transferee, to avoid going through a destructive device licensee. Call on questions 877-437-0251.